The technique factors specific to X-ray technology and patient parameters mainly affect the patient doses and image quality. The patient dose resulting from an X-ray examination depends on a number of parameters such as energy of the X-ray beam, beam current, exposure duration, type of image recording system, technique of examination and the type of X-ray generator. Therefore, it is necessary to record these parameters while measuring the doses using indirect methodology. Several studies reported the wide variations in patient dose levels e.g. up to a factor of 100 for the same X-ray examination. , A study carried out in the Irish hospitals has shown that the measured ESD values for individual patients varied up to a factor of 75 for the Lumbar spine AP examination. In view of this, international organizations have recommended the use of DRLs in diagnostic radiology. Radiation doses of patients were measured during various X-ray examinations routinely carried out using CR imaging system in our hospital. This paper reports the statistical analysis of the measured dose data and the institutional DRLs established for the CR based X-ray imaging system. This study analyzed the dose data of 1875 patients who have undergone 21 different types of X-ray examinations using CR based X-ray imaging system at our hospital. The X-ray machine employed in this study do not have AEC (automatic exposure control) system and all the machine parameters were selected manually while examining the patient. For the ease in representing the data within available space, 21 different types of X-ray examinations have been indicated by capital letters B to V rather than indicating the full name of a given examination. The radiation beam output of the machine (mGy) in air was measured using Si PIN photodiode based radiation dosimeter by varying the exposure parameters. The exposure parameters (kVp, mAs, focus to skin distance, field sizes) and physical parameters [age, height, weight, body mass index (BMI), object to image distance (OID)] of these patients were recorded. 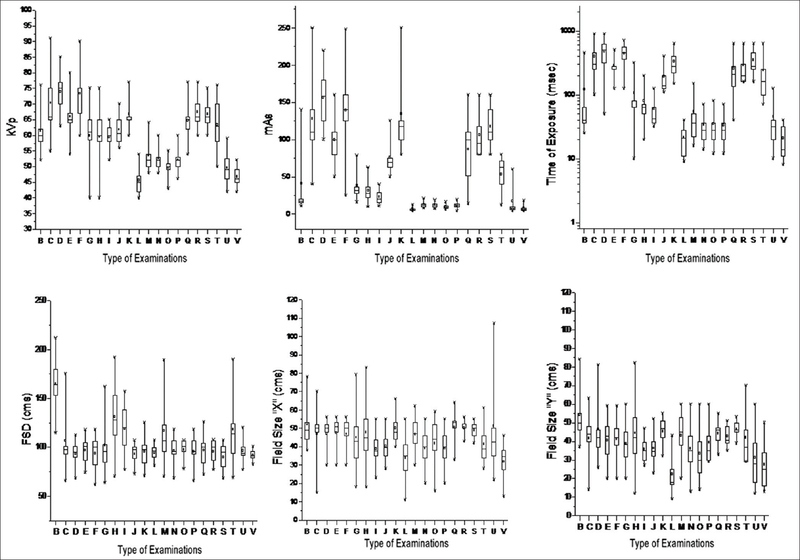 The entrance skin doses (ESDs) of these patients involving 21 different types of radiographic examinations were estimated using exposure parameters and the standard value of the back scatter factor. Five number summary was used to plot the Box-Whisker plot. A box plot contains a central rectangle (box) with lines (whiskers) that extend from both ends and it provides the information about the smallest value, first quartile (Q1), median (or second quartile, Q2), third quartile (Q3), and the largest value. The patient dose data were measured for those patients who were examined by Shimadzu Flexi Vision X-ray machine (Shimadzu Medical India Pvt. Ltd. Mumbai, India) of our hospital. The X-ray machine uses a high frequency generator with low ripple factor. Fuji computed radiography (CR) plate was used as image recording system in the X-ray examinations. Fuji FCR computed radiography system (Fujifilm India Pvt. Ltd. Gurgaon, India) was used for read out of the CR cassettes, image recording, display and analysis. For measurement of the radiation output and QA test parameters of the X-ray machine we have used the Si PIN photodiode based radiation dosimeter (Piranha, RTI, Sweden). This dosimeter is having kVp measuring range from 35-125 kVp with an accuracy of ±1.5% and dose measuring range from 15 nGy to 1000 Gy with an accuracy of ±5% in radiography mode. Before initiating the patient dose studies on the X-ray machine, comprehensive quality assurance (QA) tests were carried out on it. Also the QA tests were repeated on quarterly basis for the period of two years while collecting the patient dose data for this study. The details of QA test parameters and their tolerance values are listed in [Table 1]. 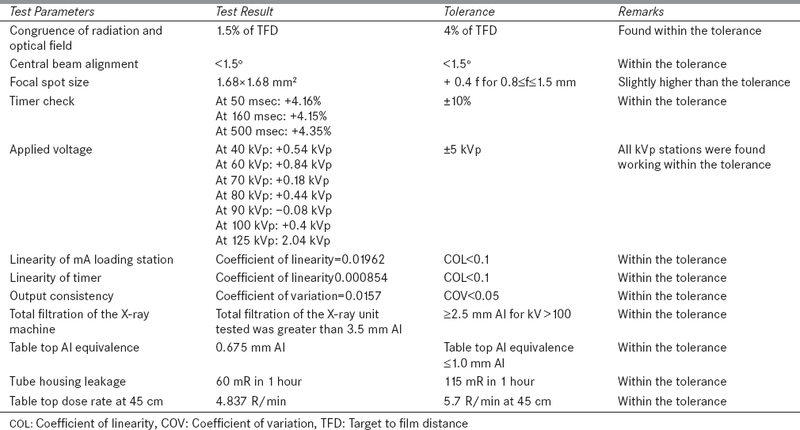 As can be seen from this table several performance parameters of the X-ray machine such as kVp accuracy, mA and timer linearity, output consistency, beam alignment, congruence of optical and radiation fields, half value layer (HVL) and spatial image resolution were periodically evaluated during the course of this study. As the patient dosimetry measurement should be performed in realistic conditions, it was important to record the patient related parameters. The patient related parameters such as body thickness, OID (object to image distance in cm) along the central beam axis for the part of the body which was under examination, Age (years), height (m), Weight (kg), BMI = [Weight (kg)/Height 2 (m)] were recorded for all the patients. ESD measurement relies on the technical parameters selected on X-ray machine for examining the patient in each radiography examinations. Therefore machine specific parameters such as tube voltage (kVp), the tube current (mA), Exposure time (msec), Focus to skin distance (FSD in cm), Field size (both X and Y direction in cms) for all 1875 adult patients were recorded. where, FDD is focus to detector distance (cm), FSD is focus to skin distance (cm) and BSF is the back scatter factor. 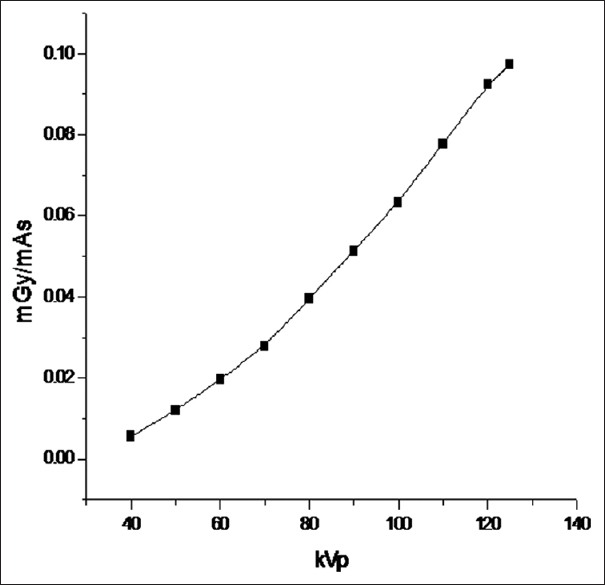 Where, K is the slope of the curve plotted between mGy/mAs and kVp 2 at a fixed d (100 cm). The value of 'n' (power of kVp) depends on the type of generator used in X-ray machine. Measured output values at 80 and 120 kVp and corresponding exposure parameters were used to estimate the value of 'n' using equation 2. On solving two equations for the output at 80 and 120 kVp, we get n = 2.0 for the medical X-ray machine used in this work. The ESD was calculated for each and every X-ray examinations carried out on the patient by using appropriate values of the parameters given in equation 1. [Figure 1] shows the variation of X-ray machine output (mGy/mAs) at various kVp settings ranging from 40-125 kVp at an increment of 10 kVp and 20 mAs at a fixed FDD of 100 cm. [Table 2] shows the range of values of patient and machine specific parameters recorded for 1875 patients during 21x-ray projections. It is observed from [Table 2] that patient specific parameters [age = 18-87 years, height = 1.25-1.94 meter, weight =34-106 kg, BMI = 15.55-36.26 kg/m 2 and OID = 3.5-66 cm] as well as the machine specific parameters [beam energy =40-91 kVp, product of beam current and time = 4-250 mAs, exposure time = 8-900 msec, and FSD = 62-212 cm] have a wide variability to represent a suitable sample size for establishing the institutional DRLs. [Figure 2] presents the relative contribution of different X-ray examinations conducted at our hospital. It is observed here that majorly performed X-ray examinations of our hospital are cervical spine AP, Chest PA and Knee Lat with percentage contributions of 16.05, 16 and 8.27% respectively. However, the lowest contribution comes from Hip Lat which is about 1.01%. 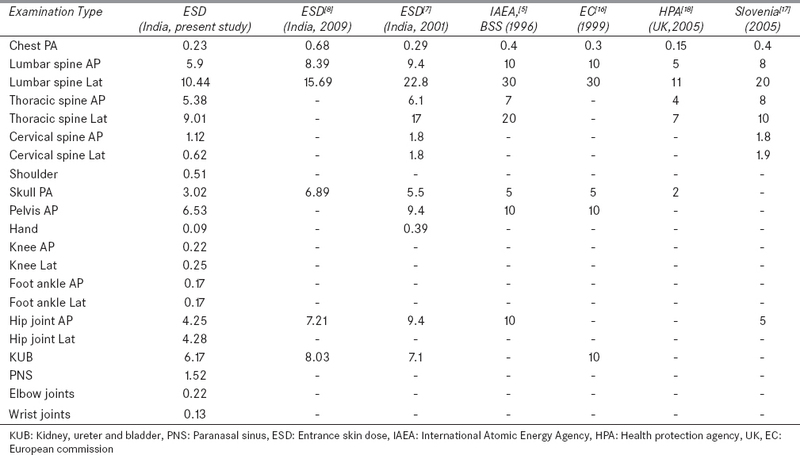 [Table 3] shows the ratio of measured maximum ESD to minimum ESD for 21 different types of X-ray examinations. The maximum value of this ratio is 50 for cervical spine AP and the minimum value is 2.68 for the Hip joint Lateral. This ratio for Thoracic Spine AP, Chest PA, Knee Lat and Lumbar Spine AP are 32.36, 30.75, 30.4 and 30.2 respectively. The reason for the wide variation in the ratio of maximum ESD to minimum ESD is multifactorial which includes variation in patient body thickness and operator specific selection of exposure technique and exposure parameters. [Figure 3] shows the Box and Whisker plot for the measured patient specific parameters [age (year), height (meter), weight (kg), BMI (kg/m 2 ) and OID (cm)] for all the 21 X-ray examinations. [Figure 4] shows the Box and Whisker plot for the measured X-ray machine parameters which are kVp, mAs, Time, FSD and field sizes used to radiograph the 1875 patients. 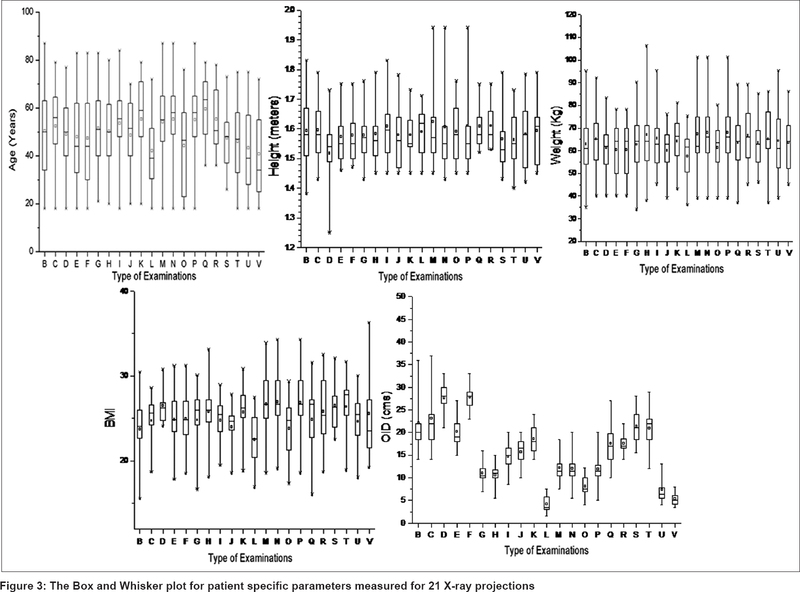 [Figure 5] shows the Box and Whisker plot for the measured ESDs in the present study. These figures are based upon the five number summaries as explained earlier. [Table 4] presents the third quartile data distribution of the present study which indicates that the age, height and weight of the patients studied lie between 51.5-71 years, 1.58-1.67 meter and 65-77 kg respectively for all 21X-ray projections. BMI ranges from 25.1-29.5 kg/m 2 and OID range is 5.75-30 cm. In case of machine parameters selected for all the 21X-ray examinations, the third quartile values for the applied kVp ranges from 47-77 kVp. For mAs it ranges from 7.05-180 and for the time of exposure it ranges from 28-630 msec. 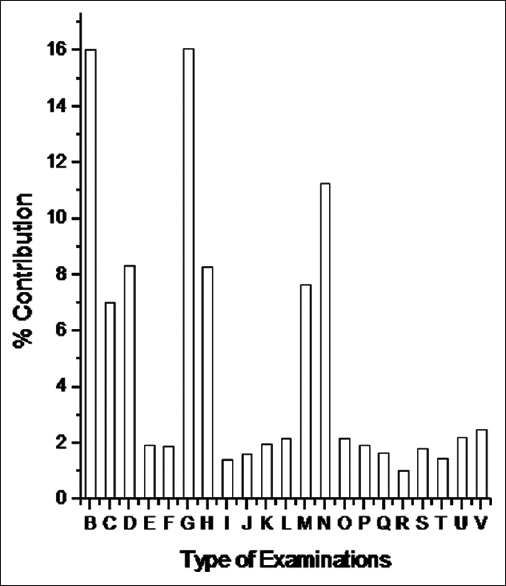 The third quartile value of FSD ranges from 96-180 cm and the filed sizes in X and Y directions ranges from 38-55 and 25-55 cm respectively. The third quartile value of the measured ESD ranges from 0.09-10.44 mGy for all the 21X-ray examinations. [Table 5] presents the third quartile value of the measured patient dose distribution for 21 X-ray radiography projections and its comparison with the established national and international DRLs by the different agencies worldover. In this comparision, the ESD values obtained for 21 X-ray projections are found to be comparable or lesser than the earlier established values. ,,,, This may be due to the fact that the present ESD values are derived for CR imaging system which comprises a recent model of diagnostic X-ray machine as exposure device and photostimulable phosphor (PSP) plate as image recording device while other DRLs are based on a variety of X-ray machines and screen-film as imaging recording system. The third quartile ESD value measured for X-ray projection of Cervical Spine Lat are lesser than the cervical spine AP which is in contrast to the results reported for Slovenia. The main reason for the contrasting observation in case of cervical spine is the difference in FSD used for these examinations in our study [Table 4]. Although the third quartile value for used kVp and mAs are the same for these two examinations but the FSD used for Cervical Spine Lat is 153.5 cm and for Cervical Spine AP it is only 103 cm. The entrance surface dose values for 1875 patients who have undergone 21 different types of X-ray examinations using CR based X-ray imaging system were estimated using indirect patient dose estimation method. 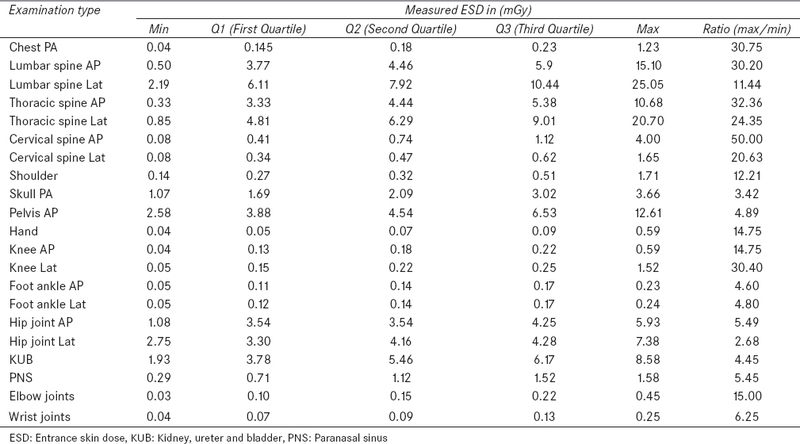 The data so acquired show the large variation in the measured ESD values. The reason for large variation in ESD was multifactorial that is variation in patient body thickness and operator specific selection of exposure technique and parameters. The 3 rd quartile values of the ESDs were recommended as the institutional DRLs for different diagnostic projections. The variation in make and model of the diagnostic X-ray machine is excluded in this study as only a single machine was used for examining all the patients. Considering this large variation in the ESD values it is recommended that every hospital should prepare a technique chart for various X-ray projections specific to the X-ray machine so that machine set parameters and X-ray technician variability can be excluded. Also the collected patient information is significant as this information can be very useful while modeling the patient dose studies theoretically. Authors wish to express their gratitude to Dr. D.N. Sharma, Director, Health, Safety and Environment Group (HS and EG), Bhabha Atomic Research Centre, Mumbai for his encouragement and support. Lu ZF, Nickoloff EL, So JC, Dutta AK. Comparison of computed radiography and film screen combination using a contrast-detail phantom. J Appl Clin Med Phys 2003;4:91-8. Rowlands JA. The physics of computed radiography. Phys Med Biol 2002;47:R123-66. Aldrich JE, Duran E, Dunlop P, Mayo JR. Optimization of dose and image quality for computed radiography and digital radiography. J Digit Imaging 2006;19:126-31. United Nations scientific committee on the effects of atomic radiation. Sources and effects of ionizing radiation. UNSCEAR Report; 2008.
International Atomic Energy Agency. International Basic Safety Standards for protection against ionizing radiation and for the safety of radiation sources. IAEA Safety Series No. 115. Vienna; 1996. Ng KH, Rassiah P, Wang HB, Hambali AS, Muthuvellu P, Lee HP. Doses to patients in routine X-ray examinations in Malaysia. Br J Radiol 1998;71:654-60. Sasane JB, Sawant SG, Shirva VK. Patient exposure from diagnostic radiological procedures in India. Proceedings of the IAEA International Conference on Radiological Protection of Patients in Diagnostic and Interventional Radiology, Nuclear Medicine and Radiotherapy, Malaga, Spain; 2001. p. 424-8. Sonawane AU, Shirva VK, Pradhan AS. 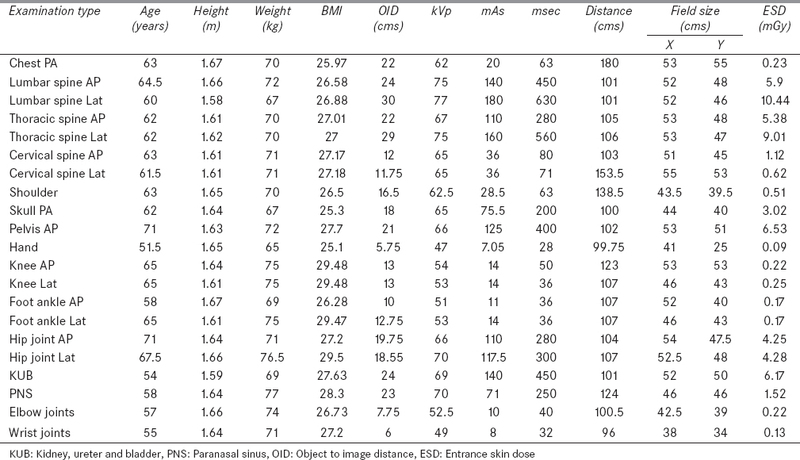 Estimation of skin entrance doses (SEDs) for common medical X-ray diagnostic examinations in India and proposed diagnostic reference levels (DRLs). Radiat Prot Dosimetry 2009;138:129-36. Sharma SD, Sharma R, Mulchandani U, Chaubey A. Chourasia G, Mayya YS, et al. Measurement of entrance skin dose for diagnostic X-ray radiographic examinations and establishment of local diagnostic reference levels. In: Long M. ed. World Congress on Medical Physics and Biomedical Engineering. IFMBE Proceedings 2012;39:860-63. 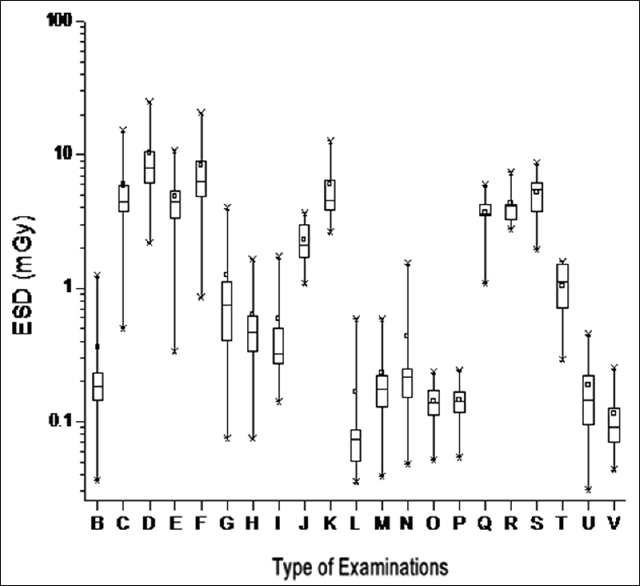 Sharma R. Entrance surface doses in majorly performed diagnostic X-ray examinations. J Med Phys 2006;31:123-4. Shrimpton PC, Wall BF, Jones DG, Fisher ES, Hillier MC, Kendall GM. A national survey of doses to patients undergoing a selection of routine X-ray examinations in English hospitals. London: NRPB-R200; 1986. Faulkner K, Corbett RH. Reference doses and image quality in medical imaging. Br J Radiol 1998;71:1001-2. Johnston DA, Brennan PC. Reference dose levels for patients undergoing common diagnostic X-ray examinations in Irish hospitals. Br J Radiol 2000;73:396-402.
International commission on radiological protection. ICRP 60. Oxford: Pergamon Press; 1990. Petoussi-Henss N, Zankl M, Drexler G, Panzer W, Regulla D. Calculation of backscatter factors for diagnostic radiology using Monte Carlo methods. Phys Med Biol 1998;43:2237-50. European Commission Guidance on diagnostic reference levels (DRLs) for medical exposures, Report of Directorate General of Environment, Nuclear Safety and Civil Protection. Radiat Prot 1999;109:14-5. Damijan K. Diagnostic reference levels for X-ray examinations in Slovenia. Radiol Oncol 2006;40:189-95. Hart D, Miller MC, Wall BF. Doses to patients from radiographic and fluoroscopic x-rat imaging procedures in the U.K.-2005 review, HPA-RPD-029; 2007.